Enter your first and second color choice. If you see a fabric that you like, please add a link or screen shot in buyer notes or a convo. I’ll use this information to select available fabrics and send pictures for you to choose from for your set. THIS IS A MADE TO ORDER ITEM - Please convo me to order a custom set in your choice of fabric. 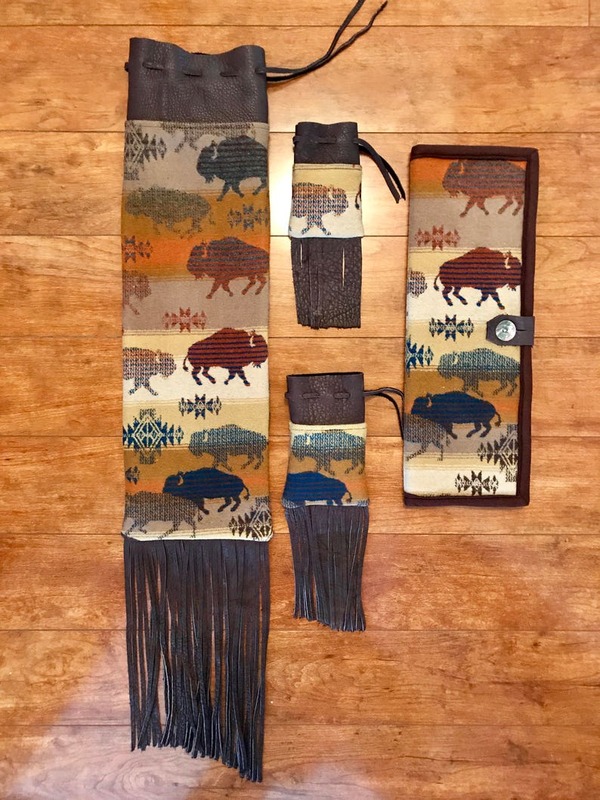 These beautiful sets are handcrafted from Pendleton® coat weight fabric and leather. Your pipe bag set and feather holder will be made from your choice of fabric. The front and back of the bags are the same. The inside seams are completely finished. The smaller pouches can easily fit in the larger bag. You can customize the sizes or items in the set to fit your needs. Please convo me for more information. Home Page: https://www.etsy.com/shop/NightOwlMarket there are several handcrafted Pendleton® wool and leather items to choose from.